New . Ceremonial unform For Korean Martial Arts.. This uniform is made the new dobby fabric material (same material used on adidas and nike grandmaster uniforms), Bleached Colourfast black made of 55% cotton, 45% polyester. 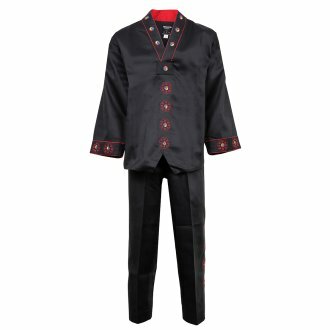 Uniform is a taekwondo style uniform with the traditional V - neck. Great For any martial arts instructors to Wear or even ..
New . Ceremonial unform For Korean Martial Arts.. This uniform is made the new dobby fabric material (same material used on adidas and nike grandmaster uniforms), Bleached Colourfast black made of 55% cotton, 45% polyester. Uniform is a taekwondo style uniform with the traditional V - neck. Great For any martial arts instructors to Wear or even to be used as a freestyle uniform by students. Suit comes complete with Jacket and trousers The Motif Design Displayed in the 5th image which is shown of the cuffs of the jacket is embroided throughout the whole suit, to give the suit that outstanding look. Motif Logo embroided on boths sides of legs, On both Cuffs of jacket and front of jacket.